Kansas progressives and Democrats oppose a judicial selection system that is used by U.S. Presidents, both Democrats and Republicans. What is the substantive difference between these two systems? A) A state’s chief executive appoints a person to be a judge on the state’s highest court. Then the state’s senate confirms or rejects. B) A nation’s chief executive appoints a person to be a judge on the nation’s highest court. Then the nation’s senate confirms or rejects. Kansas exhibits a pattern of selecting governors from alternate political parties. For Kansas progressives and Democrats to oppose Kansas adopting the same system that has enabled Barack Obama to appoint two liberal justices to the U.S. Supreme Court, with perhaps more to come — don’t they realize that Kansas will (likely) have a Democratic governor someday? 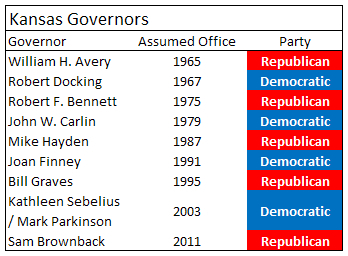 As Clay Barker noted, for the last 50 years, no Kansas governor has been followed by a successor of the same party (except for Mark Parkinson filling the remainder of a term after Kathleen Sebelius resigned). If that pattern holds — and there’s no guarantee that it will — the next Kansas governor will be a Democrat, just three years from now. Superficially, it doesn’t seem to make sense for Kansas Democrats to oppose the governor making judicial selections while supporting the President of the United States having the same power. It does make sense, however, when we realize that Kansas Democrats are comfortable with the state’s bar selecting the judicial nominees that the governor may consider. (Which gives truly useful and enjoyable bars a bad name.) Lawyers, especially lawyers that take an active role in politics, tend to be Democrats, and progressive Democrats at that. If the Kansas bar was dominated by constitutional conservatives, would Kansas Democrats feel the same? I’m not claiming that the motives of conservative Kansas Republicans are pure. Will they change their stance on the desirability of the governor appointing Supreme Court judges if there is a Democratic governor? I don’t know, but I have a suspicion. The Kansas Supreme Court is flawed by the ethical lapses of the Chief Justice Nuss who was disciplined for his misconduct in having private meetings with litigants in a case before the court. Nuss was lucky that he was only “admonished,” as opposed to having a more serious charge, can anyone spell impeachment, for his outrageous misbehavior. This occurred in the important school finance lawsuit before the court by meeting with legislators a couple of years ago. 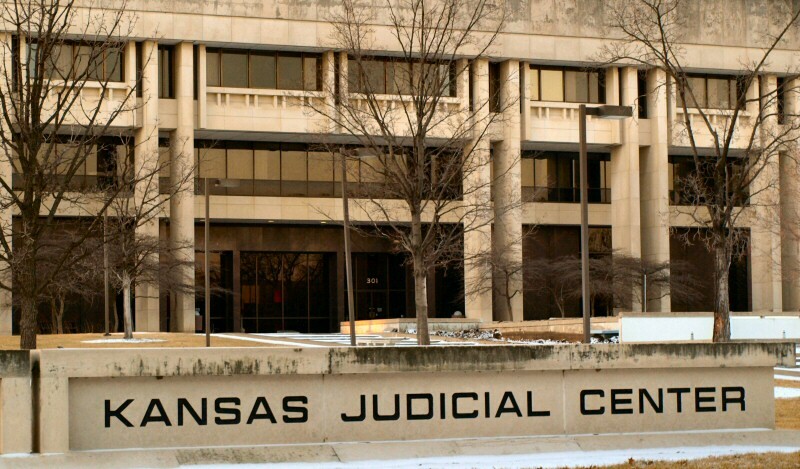 There has been other misconduct by ethically flawed Kansas Supreme Court members too. This is a court that has been regularly reversed by the U.S. Supreme Court in criminal cases, the last time by an 8 vote majority that crossed the usual left-right divide at the US Supreme Court. The KS Supreme Court is a black robed legislature of un-elected appointees who like their former colleague Allegrucci, could not hold onto even an appointed legislative seat when they had a named, political opponent. The KS Supreme Court needs to remove all of the judges who sat in the awful Carr brothers case that was reversed by the US Supreme Court.